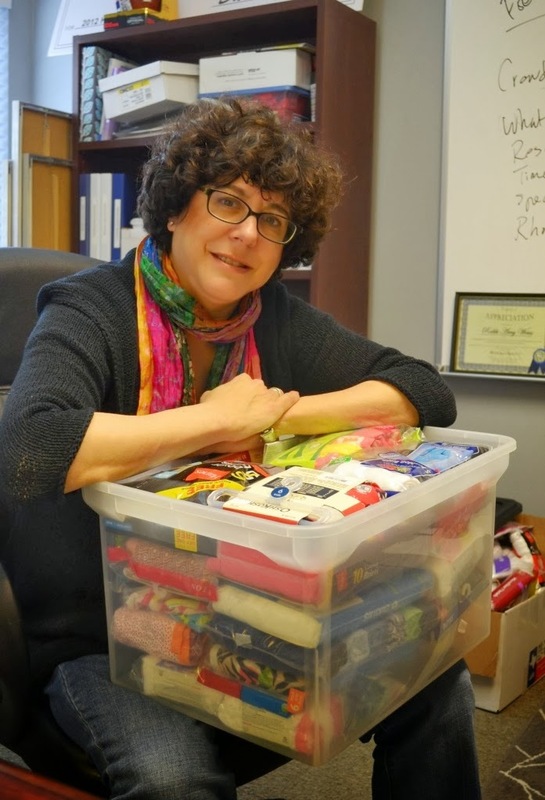 Rabbi Amy Weiss is the founder and executive director of Undies for Everyone, a non-profit organization that distributes new underwear and socks to underprivileged students in Houston’s school districts. She founded the Initiative for Jewish Women and serves on the Independent Police Oversight Board in Houston. She is the Director of Food and Nutrition for Houston Hillel, the campus organization for Jewish students, where her husband Rabbi Kenny Weiss is the executive director. She has two sons, Eli and Joshua. Ever since I was a child I wanted to have a house full of people. As a rabbi, I meet so many people who are new to Houston – we called them strays – and we welcome them in. That’s just so fulfilling to me. I became a rabbi to make Judaism more accessible, so it's not unusual for us to have fifty people for Passover in our house every year. I love making people happy and I love nurturing people. That's why I do all the cooking here at the Hillel. For example every Tuesday and Wednesday we do lunches here for the students. A friend of mine and I bake cookies at the beginning of every semester and put them in the freezer so the kids have homemade cookies for every lunch, because they should feel comforted and nurtured. I guess that I treat others like I would like to be treated. Growing up in Dallas, I was very involved in my youth group and was a song leader, playing the guitar all over Texas and Oklahoma at conventions of hundreds of Jewish kids. After getting a degree in advertising from the University of Texas, my first job was selling advertising, but on the first day, literally the first day, I remember thinking this just isn't right for me. Eventually I found myself involved with my synagogue again and the rabbi there took me under his wing. He wanted me to become a rabbi and after getting my Masters in Jewish Education, I began the rabbinic program at Hebrew Union College in New York. On the last day of my first week, I met my husband Kenny who was there leading a teen trip. He came to my house for dinner and we've been together ever since. That was 1991. It seems like yesterday but at the same time it just seems like so far away. In 1995, when we were living in Washington DC, our first son Aaron was born prematurely and died. Then, after having trouble getting pregnant again, we had Eli in 1997. When Eli was eight months old we moved to Pennsylvania and since there nothing else to do I got pregnant again, but I lost that one. I got pregnant again and in 1999, we had Joshua. Aaron, Eli and Joshua – you can tell we're rabbis, we're so biblical! We moved to Houston in 2001 when Kenny got the chance to apply for the job at the Houston Hillel. He just fell in love with it, so we moved here a year later. Losing our first son, Aaron, really changed me. When Eli and Joshua were born, I figured if God is going to give me these children I’ve got to do something with them, I have to be there for them. I can't be a congregational rabbi and have two kids. Some people can do it but I can't. So I started the Initiative for Jewish Women (IJW) and did that for seven years. I was programming for Jewish women, but the truth of the matter is that there's a zillion things for Jewish women to do and I after a while I found I couldn't differentiate myself. By 2008, I was also blogging for the Houston Chronicle’s religion section and around October time, when everyone was doing endless holiday toy drives for underprivileged children, a social worker said to me, “You know what these kids really need? Underwear and socks!” So I blogged about it and people started dropping things off here. I got a few hundred pairs and I talked to Waste Management to get boxes. I pulled together a committee and Undies for Everyone just sort of grew and grew from there. Then last year, my dad died. So I stood back and re-evaluated my life, and I thought, “You know, the Jewish ladies don't need me as much as these kids need their tushies covered.” So I let the IJW go, and focused my energy on Undies for Everyone. I got some friends, filled out the paperwork and it is just unbelievable how fast it all developed. In our fourth year, we gave out 10,000 pairs and this year we gave out somewhere between 33,000 and 38,000. We even had a donation from the man whose family owns the company which supplies Target with all the Disney and Marvel-type underwear. They are Jewish so someone had given him our details and he sent us 43,000 pairs of underwear. Elyse, our board chair, and I flew to New York in October to meet him, so now we have a relationship with him and another company in New York. That's where we get the big stuff but also individual people or schools have underwear drives, where they ask everyone to bring one packet. There are two parts to our organization. Obviously our first priority is about covering the kids who are disadvantaged, so there is the collection and distribution of mass quantities of underwear, but we also offer the opportunity to give to anyone who wants to do something for someone else. Some people can write really large checks or even medium-size checks, and other people can go buy one packet of underwear. Either way, they will know that they have changed someone's life and I think that changes their life too. Our idea is also that we have to teach our kids how to give. A parent can use Undies for Everyone as an opportunity to take a kid to the store and say, “You have a whole drawer full of underwear and you take it for granted. But there are kids out there that don't have any underwear at all, and doesn’t most everyone deserve to have underwear?” Everyone can identify with that. So let your kids pick a pack of underwear to give to someone else and that's the start of teaching those kids about being philanthropic and giving them the opportunity to repair the world. Once we have all these undies, we distribute them in a number of ways. The City of Houston runs a Back-to-School event which pre-registers 25,000 kids in fifteen school districts. Each of them gets a wrist band which gets them a backpack and supplies, vaccinations, uniforms and even haircuts. We, of course, give away underwear. I think 15,000 pairs went there and another 10,000 pairs went to Houston Independent School District nurses, not only for the elementary schools where little kids have accidents but also to the middle school nurses who really love it because teenage girls are not regular yet in their cycles. We gave 3,000 to Fort Bend schools, 2,000 to Alief and to Waller and we will soon expand into charter schools and places like that. For the future, we already have a trademark attorney and we are looking to go national within a few years. You know, it's God's work. This is not just about covering these kids’ privates, it is about dignity and self-esteem. It represents so much more for them, it’s about being like everyone else so they don’t have to worry about someone else finding out they aren’t wearing any. Is there more to your story? I don't blog for the Chronicle anymore but I do make mezuzahs out of Lego! And yes, that is extraordinary, but I am all about making Judaism accessible! A mezuzah has a prayer in it and you put it on your door frame. When I was growing up, people only put up one mezuzah, but in traditional Judaism, you're supposed to have one on every door in the house, except the bathroom and the laundry room. 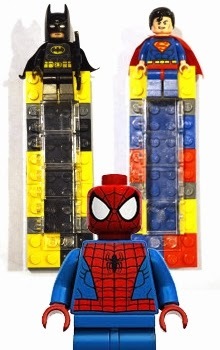 So for people who normally wouldn't put a mezuzah on their kid’s bedroom door, here's this really cool thing, and since everybody loves Lego, you're giving the kids an opportunity to connect. It's not scary, it's not old and it's not weird. It’s just really cool! It's really hard to say because there have been a lot of people who have influenced me, but I think my husband is really the greatest influence. He allows me every opportunity to be successful. I worry a lot and it can be paralyzing and he just doesn't let that happen. He doesn't let difficulties or worry stop him. He will do anything to give me an opportunity to shine and he has just been the best thing that ever happened to me. He’s an awesome, awesome guy. What advice would you give to someone who sees a need in the community and thinks they have something that can help fill that need? Go talk to lots of people and make sure that need isn't being filled by someone else. If you want to succeed and you want to make a difference, you have to know that you are doing something different from all the many other non-profits in Houston. Otherwise you are not going to get funded and you're not going to get people on board. The other thing I would say is take Rice University's Leadership Institute for Non-profit Executives course which has been phenomenal. It's a one year course and I have met some of the greatest people. I've just loved it. You know I’ve given that a lot of thought and I don't think there really is balance. My family comes first and everything else comes after. There are always things to do, including this job, so that I can be there for the kids and for Kenny, because the home is the center of it. Everything else just fills in around it. I have also just accepted that I'm not going to be able to do everything fabulously. It is so clichéd, but I think Houston is the city of opportunity. It is a really diverse city, in thinking and believing, with lots of different religions, but ultimately so many people do so much work for Houston to make it a better place. It's just amazing. It’s the swing on our front lawn at home. It hangs from a tree and sometimes Kenny and I will sit there and just hang out, throwing a ball for the dog. But really, wherever I am, if I have my family and my friends near, I'm okay. As long as the food's good! Our go-to place is India’s, on Richmond, which is really good. It's from the 80s or the 70s, it has commercial carpet but the food is great and the people are so nice. It’s so quiet, you can go on Saturday night with another couple and have a conversation and some really good food. The Chocolate Cinnamon Shake at Goode Company Taqueria! It's not even a milkshake really, more like soft serve ice-cream. In fact, they don't even serve it with a straw. I don't know if it's actually a kids’ thing though because it has quite a cinnamon bite to it. It's awesome! The weather or the potholes! The weather because I'm not good at sweating. And the potholes? I think the tire people go out at night to dig them. For more information about Amy’s work at Undies for Everyone, click here. To see Amy’s Lego mezuzahs, click here. For more information about the Rice University Leadership Institute for Nonprofit Executives, click here.